Lumea Copiilor Park is a beautiful new sector made particularly for children and families. From many sport and leisure playgrounds, we can see people in action. Every meter is an interesting landscaping arrangement to observe. The mayor and his team are still working very hard on new projects for this area to become unique and known around the world. Orăşelul Copiilor, that means the children’s city, is an amazing kid’s land. All the restaurants and commerce are located in personalized colorful and original constructions. A very animated attraction park where we can ride in many directions without getting bored of looking around and feeling the special ambiance. In this tour, we are going to ride more kilometers through the sinuous paths surrounded by pure green nature. From many angles, we can admire the outstanding view of the very particular Tineretului Lake. Breathing in that park makes us almost forget that we are situated in the big Bucharest City. Very resourceful and a completely different experience than a never ending historical speech. This park possess the famous Mausoleu monument, the beautiful Zodiac Fountain, the Technic National Museum and many historical marks from the last 100 years. 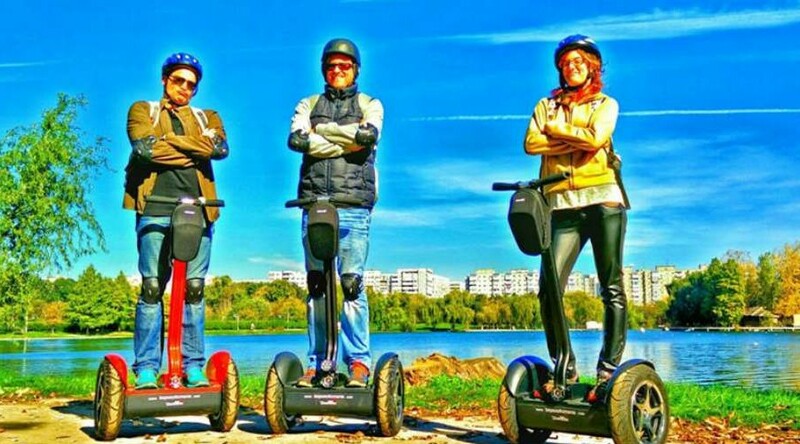 All surrounded by a beautiful natural landscapes and a peaceful atmosphere, Carol Park really deserves to be visited by Segway. The oldest public garden of Bucharest, Cişmigiu , attracts everyday thousands of people. Located close to the historical center, it is a very strategic area to receive tourists, professionals, families, everyone actually. This park really feels like having a soul, a past with all these old trees, flower arrangements and original statues.